When shopping for a pashmina scarf or shawl, the most common visual difference you will notice is that pashmina has a shimmering silky luster. Also you will see that pashmina silk blend is also made with a tighter weave that you usually see with items blended with silk. This tighter weave is what works to enhance the smooth texture and sheen. If you want a fluffier look and feel, then you could always select a 100% pashmina item. The sheen from pashmina makes an attractive option when one is attending a wedding or any other type of formal event, where dresses for these occasions are made from fabrics that have a sheen appearance, such as satin or silk. Besides the graceful look of a pashmina scarf or shawl, you will also notice the warmth that pashmina gives. 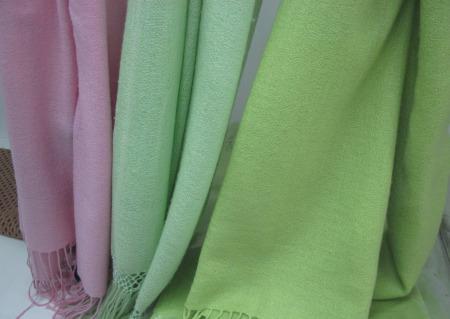 If you select a 100% pure cashmere pashmina accessories, then the fabric will be warmer than a pashmina silk blend. It's amazing that such a light-weight fabric can offer such warmth and comfort. A pashmina scarf or shawl is perfect for cold winter months. The silk content percentage is marked on pashmina items; so you can use this as a reference when selecting the amount of warmth you want from a pashmina scarf or shawl. Another factor contributing to the warmth of the fabric is the ply. You can select different ply levels such as 1 ply, 2 ply or 3 ply.